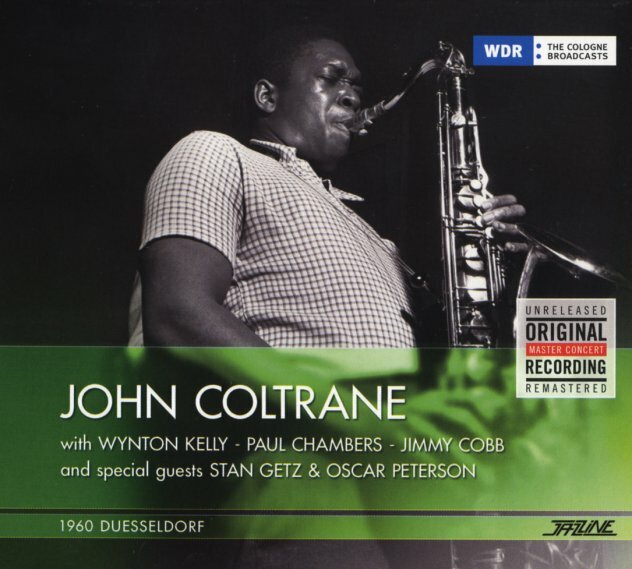 A really unusual performance from the mighty John Coltrane – recorded in Germany in 1960, with an amazing group that features Wynton Kelly on piano, Paul Chambers on bass, and Jimmy Cobb on drums – stepping out from Miles Davis to give Trane a very special groove! These guys give the record a very different swing than some of Trane's other albums of the period – and Kelly punctuates some moments with a soulful style on piano, while Chambers bows his bass a fair bit, which creates these shaded, moody tones. Coltrane himself is wonderful – that clear-blown, incredible sound of his Atlantic years – maybe the best-recorded instrument in the setting, with with beautiful solos that are worth the price of admission alone. Stan Getz makes appearance at one point, as does Oscar Peterson – although the notes aren't that clear – but just concentrate on Coltrane, as that's all you'll need! Titles include "On Green Dolphin Street", "Walkin", "Rifftide", and a medley of "Yesterdays/Autumn Leaves/What's New". © 1996-2019, Dusty Groove, Inc.